Kazakhstan is important to world energy markets because it has significant oil and natural gas reserves. With sufficient export options, Kazakhstan could become one of the world's largest oil producers and exporters in the next decade. But Kazakhstan's strategic aspiration is to become a modern, diversified economy with a high value added and high-tech component, well integrated in to the global economy. The energy sector is viewed as a good basis to achieve this goal. The perspective of the Economy of Kazakhstan is closely connected with further integration into international economic relations, utilization of unique reserves of energy and mineral resources, vast possibilities to export industrial and agricultural products, optimum employment of country's transit potential and also with availability of highly qualified specialists in different spheres. During the Soviet period Kazakhstan was an agrarian, raw materials supplier of the former Soviet economy, where the military industry played the major role. The main economic content of more than 10 years of independence has become transition from the central command planning to a market system. During these years, Kazakhstan has made considerable progress in implementing complex political, economic and social reforms to establish a democratic state with a market economy. While the country has not experienced political disturbances during the transition period, it has faced numerous economic, social and environmental challenges. The first few years of Kazakhstan's independence were characterized by an economic decline (mostly due to the destabilizing force of disintegration of the Soviet Union): by 1995 real GDP dropped to 61,4% of its 1990 level. This economic deterioration exceeded the losses experienced during the Great Depression of the 1930s. The wide-ranging inflation observed in the early 1990s peaked at annual rate of up to 3000% in mid-nineties. Since 1992, Kazakhstan has actively pursued a program of economic reform designed to establish a free market economy through privatization of state enterprises and deregulation and today is generally considered to be more advanced in this respect than most other countries of the CIS. Kazakhstan remains one of the most successful reformers in the CIS, though its record is less strong when compared with more advanced transition countries of Central and Eastern Europe, and it has the strongest banking system in Central Asia and CIS. The main goals of current structural policy are diversification and the strengthening of the non-oil sector. A number of development agencies and research centers (Development Institutions) have been established and the Government is looking at establishing techno and science parks to support the diversification of higher-value added industries. But there are certain obstacles inherited from the past to quickly achieve this. The EU and USA have recognized Kazakhstan (first in the CIS) as a country with market economy in 2001 and 2002 respectively. In October 2002 international rating agency Moody's upgraded Kazakhstan by two notches to Baa3, thus Kazakhstan has become the first country in the CIS to reach investment grade status. Standard & Poor's in 2004 upgraded Sovereigns rating to BBB/Stable/A-3. In October 2004, Fitch upgraded Kazakhstan's local currency rating to BBB/Stable. In January 2005 the Organization for Economic Cooperation and Development (OECD) has upgraded Kazakhstan's country export risks rating, moving it from the 5th to the 4th group of risks. Kazakhstan has enjoyed impressive economic growth over the past five years, buoyed by increased oil exports, as well as by bold economic reforms, prudent fiscal policies and economic initiatives that were instituted in 1999. This has resulted in a stable level of inflation (2002 - 6.6%, 2003 - 6.8%, 2004 - 6.7%, 2005 - 6.6%), a budget surplus, a firm currency, and a decreasing unemployment rate (2003 - 8.8%, 2004 - 8.4%). After posting moderate growth of 2.7% in 1999 as a whole, Kazakhstan's real gross domestic product (GDP) rose 9.6% in 2000, 13.2% (2001), easily the country's best year of economic performance since independence, 9% in 2002, 9.1% in 2003, 9.3 in 2004 and according to The Economist Intelligent Unit Kazakhstan is within Top 10 world fastest-growing economies in 2005. The main driver behind Kazakhstan's economic growth has been foreign investment, mainly in the country's booming oil and natural gas industries. Since independence from Soviet rule in 1991, Kazakhstan has received more than 30 bln. 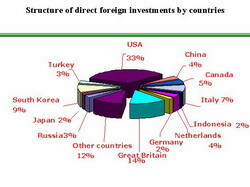 US$ of foreign direct investment - the highest per capita indicator in the former Eastern Bloc. Hard currency reserves of the National Bank and National Fund combined reached US$ 14.4 bln. in 2004 (growth 66.3%). In 2004 the minimum wage in comparison with 2003 grew by 32% and average wages grew by 21.4%. Real income during this period grew by 13.5%. Real growth of average monthly pensions was 23.4% and there has been a significant increase in social payments by the state. As US Under-Secretary of state for Economic Business and Agricultural Affairs, Mr. Alan P. Larson, said recently in his address to the American Chamber of Commerce in Kazakhstan: "Since its independence in 1991, Kazakhstan has been in the midst of a remarkable transition from communism to free markets. When completed, this transformation could bring Kazakhstan into the global marketplace in a way not seen since Central Asia dominated international trade routes hundreds of years ago. Kazakhstan's current leaders are laying the foundation for its integration into the global economy. At independence in 1991, Kazakhstan had a promising resource base, from its sizable hydrocarbon reserves to its well-educated workforce. More importantly, though, it had the wisdom to move quickly away from the failed policies of the past. Kazakhstan's leadership embarked on a new - transformational-course. In a little over ten years, Kazakhstan implemented a series of broad-based reforms that brought Kazakhstan from planned to market economy. Kazakhstan undertook a process of demonopolization, privatization, debt restructuring, price liberalization, customs reform, and tax restructuring. Kazakhstan established a securities and exchange commission, liberalized trade, enacted laws on investment, established a new government procurement process, and reformed the banking system. The United States formally recognized this achievement when, in March 2002, it accorded Kazakhstan the status of a market economy, and these reforms yielded impressive results at home. The Government of Kazakhstan has privatized much of the economy, although much work needs to be done to restructure major sectors such as telecommunications. The banking sector has flourished. The financial system has been a leader in innovation, including the emergence of successful private pension funds, the establishment of a national fund to preserve oil wealth for future generations, and a budding mortgage-lending market Unemployment, while still high in Western terms, is lower than elsewhere in the region. These impressive reforms took place against a background of internal political stability and gradual advance of democratic reform and a civil society. We are heartened to see that economic reform is continuing. Introducing diversity into Kazakhstan's economy and freeing its human potential will require a huge national effort and, a renewed commitment to democratic and market reforms; and a key objective will be making this new economy open to outside investors. The United States has decided to support this effort through the Houston Initiative - a comprehensive partnership with Kazakhstan to build a modern, market-based economy, with particular emphasis on small and medium enterprises. We look forward to working with the Government of Kazakhstan, with local governments throughout the country, and especially with individual entrepreneurs to realize the full potential of Houston Initiative. Now country's investment potential is based on minerals and raw materials. Because their exploitation creates more than a half of the gross product, the quality and extent of deposits utilization and the reproduction of raw material reserves play decisive role in the present and future of Kazakhstan. For example, it is supposed that exploitation of the oil and gas field Kashagan which is one of largest fields in the world will make Kazakhstan one of the major producers of hydrocarbons not only on the regional, but also on the international level. According to certain estimates, in the next 10 years the oil and gas sector of the country, particularly the Kazakh sector of the Caspian Sea, could attract between to 150-200 bln. US$. At the same time, the Kazakhstan Government's top priority is to encourage foreign direct investments into industry, agriculture, innovation, processing sectors in order to decrease the dependence of the Economy of Kazakhstan on energy and extracting sectors and to ensure continued growth of Kazakhstan's economy. Aiming at attracting foreign direct investments Kazakhstan carries out the policy of ensuring stable macroeconomic environment and realizes other measures which contribute to the improvement of investment climate in the country. The Government and the National Bank pursue the co ordinated policy directed to ensuring sustainable economic growth with low inflation rate and budget deficit not higher than it is envisaged. The new Tax Code which has recently been adopted secures principles of liberal market economy and, therefore, creates favorable conditions for all businessmen. Beginning from the 1st of July 2001 the rate of the VAT was decreased from 20% to 16% and the social tax rate from 26% to 21%. For the purpose of meeting current requirements and those of future generations at the account of reserve resources the National Fund has been formed in Kazakhstan in 2000 accumulating external proceeds to the budget from the activity of Kazakh and foreign enterprises in the oil sector and aiming at stabilization of state budget revenues. Now there is about 5,3 bln. US dollars (2004) on the account of the National Fund. Besides, the National Development Bank with the charter capital of about 250 mln. US dollars has been established in 2001. Its activity is directed to crediting investment projects, which ensure economic diversification and upgrade of industrial infrastructure in the country. Now with Fitch rating upgraded in 2004 to BBB-/Positive the Development Bank is able to attract worldwide investments for further activity. In addition to the above two development institutions and to stress the importance of building a modern non-oil dependent economy the Government of Kazakhstan has adopted in 2003 the "Innovative Industrial Development Strategy until 2015" which among other things provides for the early establishment of three new development institutions: Industrial Investment Fund with charter capital of over 160 mln. US$, Innovation Fund with about 70 mln. US$ and Export Credits Corporation with over 55 mln. US$ all deriving money from oil revenues. All these institutions serve the further development and diversification of the economy of Kazakhstan. Thus, during these years Kazakhstan has covered a path which has not been easy, and has achieved significant results. Having created and strengthened sociopolitical stability by implementing democratic and market reforms on a steady basis, Kazakhstan has gained macroeconomic stability, formed legislation essential for conducting successful business, and realized structural reforms which, while being unpopular initially, created a firm basis and favorable environment for the accelerated development of the country in the mid and long terms. During the first decades of the Soviet regime (1920's and 30's) the Kazakhs, like all other populations of the former USSR, was attacking an ancient backwardness and struggled against poverty and economic inertia. Russians and other fraternal people participated in the construction and exploitation of the mines, plants, and factories in Kazakhstan, in the agricultural reforms, and the development of education, science and culture. Many big plants and factories had already been built on the vast territory by 1940. The steppe was crossed by new railway main lines, big new agricultural enterprises were built, and livestock breeding began to develop intensively. All this gave Kazakhstan the possibility of supplying the front and rear areas of the USSR with military and strategic raw materials and food during the Second World War of 1941-1945. During the war, Kazakhstan manganese from the Ural plants replaced manganese from Nikopol (Ukraine); Karaganda coke together with the coke from Kuznetsk was used in the metallurgy of ferrous metals plants; 9 of every 10 bullets were moulded of Kazakhstan lead. During the world war, Kazakhstan increased the extraction and smelting of ferrous and non-ferrous metals: ferrochromium, molybdenum, lead, copper, tungsten, tin, etc. During the four war years, coal extraction in Kazakhstan increased by 75%. In comparison to the pre-war period, the extraction of oil increased by 2.5 times, and the production of light industry increased 700%, etc. In 1920, the production of industry in Kazakhstan was only 5.3% of the total production of the Kazakh economy, but by 1945, that figure had reached nearly 66 per cent. If Kazakhstan and Tsarist Russia were behind the advanced countries by 50-100 years in technical development, then in the pre-war, war and post-war periods our people greatly reduced that distance. As a result, Kazakhstan became one of the leading industrial centers of the former USSR and held fourth place among the other republics. In that period, different branches of economy began to develop in Kazakhstan. For example, in 1991 the share of agricultural production was 36% of the total volume of the economic production of the republic, industry - 31%, construction - 15%, transport and communication - l0%, and trade and services - 5%. Under the Soviet regime, Kazakhstan began intensive work on the development of the raw-materials base and in the extraction of all kinds of mineral wealth. Powerful mining enterprises were built across Kazakhstan. During all those years, enterprises worked on increasing project capacities. The infrastructure formed and developed around these enterprises. However, the extracted products of mining, smelting, and oil and gas was exported from Kazakhstan, and the profit, which was needed for the development and improvement of the peoples' prosperity, was not returned to Kazakhstan. For example, in 1991, 92% of the refined copper, at a price of 371 roubles (approximately 620$) per ton were exported from Kazakhstan, while the world price was 2557$ per ton. 38.3% of the coal at a wholesale price of 17.25 roubles, compared to the world price of 32$ per ton, was exported from Kazakhstan, and the situation was the same with other kinds of resources which were exported to the other republics. In the same year, 1991, Kazakhstan was able to satisfy only 42% of the local consumer market with its own products, which means that Kazakhstan was formed and remained as a raw material supplier to the economy of the USSR. Up to this point, Kazakhstan had remained a country with a primary economy - mining, industry and agriculture, but at the same time one with a big pantry of mineral wealth. Nevertheless, honestly speaking, during the Soviet regime Kazakhstan was transformed into a great industrial and agricultural region. Huge centers of energy, metallurgy, fuel, chemical and machine-building industry were built in the republic. Now, Kazakhstan is the biggest producer of ferrous and non-ferrous metals, uranium, coal, oil, corn, and products of stock-breeding. The years of the Soviet regime were the most favourable for the development of Kazakhstan's economy with regard to the production of these heavy industries. In spite of the serious recession in production which has taken place during the last few years, Kazakhstan remains the largest producer of non-ferrous metals: 88.5 thousand tons of lead, 255.6 thousand tons of refined cooper, 169.2 thousand tons of zinc, 9.6 thousand tons of sponge titanium, i million tons of alumina, 3.3 mln. tons of bauxite and many other kinds of non-ferrous metals and rare earth minerals. Because of the disorganization and breakup of economic contacts between the enterprises of the CIS, and due to the crisis in the economy, which was caused by the difficulties of transition to a market economy and resulting sharp fall in discipline and responsibility among officials, the volumes of industrial and agricultural production in Kazakhstan (exactly like the other republics of the former USSR) for the period 1992-1995 sharply decreased. According to the estimation of some leading specialists, in 1992 the slump in production against the relatively stable level of 1990 was 14.6%, in 1993 - 28%, in 1994 - 48%, and in 1995 - 57%. So, the indicated data from 1995 do not show the real scientific and technical potential of Kazakhstan one may use for the estimation of the industrial and economic possibilities for internal and external business. In 1991, on the eve of the present general crisis (in some branches it had already started), in Kazakhstan was produced: 5,069 kwh of electricity, 1,568 kg of crude oil, 7,687 kg of coal, 466 cu. 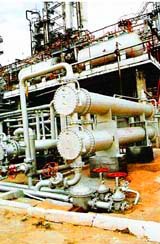 metres of natural gas, 1294 kg of iron ore, 375 kg of steel, 448 kg of cement, 88 kg of mineral fertilizers, more than 13 sq. metres of fabric, nearly 7 pieces of knitted goods, 2 pairs of leather footwear, 80 kg of bread (industrial production), 18 kg of sugar, nearly 13 kg of confectionery goods and 22 standard cans of tinned goods - per capita. Kazakhstan has enormous agricultural possibilities. In 1992, 38% of the national income was related to agriculture. At the same time, only 16% of the labour force was involved in agriculture. That fact indicates the presence of large-scale mechanization and the relative effectiveness of agricultural production. 82% of the total 222.5 mln.ha of the territory is used for agriculture. The area of ploughed fields is more than 36 mln. ha. Our republic takes sixth place in the world, and as for the indexes of hayfields and pastures, they are higher than in Russia by a factor of two. The production of corn and beans in 1990 (the best year for the last periods was 1702 kg per capita (at the same year the highest production in the world was in Canada - 2158 kg and in Denmark - 2001 kg. In Australia it was produced only 1365 kg, in USA - 1253 kg, in Hungary - 1220 kg, in France - 1030 kg). As for the production of wheat (967 kg per capita) Kazakhstan gave up the place only to Canada (1168 kg), leaving behind Denmark (792 kg), Australia (859 kg), USA (298 kg), Hungary (594 kg), and France (591). Now, as before, Kazakhstan is the only country of the former USSR which exports bread. Hard and strong types of wheat of high quality are produced in Kazakhstan. However, the average yield of corn and agricultural crops also fell as the productivity of stock-breeding in Kazakhstan is one of the lowest in the world. For example, in the favorable year of 1990, the yield of corn was 12.2 centners per ha (in 1991 - 5.3 centners). Kazakhstan took last place in the USSR and 142nd place in the world, which means that Kazakhstan was the neighbour of Mongolia, Mali, and Greenland. In 1990, milk production was 2357 kg per cow and Kazakhstan fell behind countries with well developed stock-breeding, such as: USA (6673 kg), Denmark (6265 kg), Sweden (6213 kg), Canada (5780 kg), Finland (5446 kg), United Kingdom of Great Britain (5215 kg), Japan (5096 kg), and Hungary (4919 kg). Among the former republics of the USSR, Kazakhstan took 12th place, leaving behind only the Caucasian republics. At the same time, with the serious shortcomings in agricultural production, one can take into account large and annual deviations of the products' volumes in accordance with weather conditions. For example, the record harvest of corn in 1992 followed a 60% slump of corn production in 1991. So, especially in that sphere of the economy, that is to say in agriculture, the problem of the changes in the approach to development sharply rose. On one side, because of the position of the interests and possibilities of the independent state, and on the other because of the necessity of the quick assimilation of the new methods of management and wide introduction of progressive technology to increase the productivity of fields and farms, extention of the volumes and improvement of the methods of processing, storage and transportation of the raw materials, and creation of a developed social infrastructure in the villages. However, that global and urgent problem is being solved very slowly, and during the last years, the agriculture of Kazakhstan has been involved in a serious crisis. 36,300 different agricultural enterprises and 30,800 farms are combined into the agricultural and industrial complex of Kazakhstan. According to the conclusions of many authoritative scientists, the lands of Kazakhstan can feed more than one billion people if reasonably used. In 1992, work on the reformation of the economy to a market basis began, and at the end of 1993 was made more active. During these years especially, the process of the formation of a multi-structural economy geared up. 91,300 economic enterprises, of which 73,400 represented the non-state sector, operated in Kazakhstan at the end 1995. The portion of industrial production produced in 1995 by enterprises in the non-state sector of the economy was 30.4%; their share of the volume of gross production in agriculture was 38.9%. Medium and small businesses are developing in the republic. At the beginning of 1996, 21,300 enterprises and organizations were represented and 147,200 people worked at these firms. At the same time, the continued process of privatization is one of the factors which is promoting the development of business. During 1993-1995 9,000 different enterprises were privatized. According to the program of total privatization, which now is practically finished, 2,000 enterprises (especially in the sphere of services) have been sold at auction. 93% of 2,120 state farms and other more or less large agricultural enterprises have been privatized. As a result of the privatization and formation of non-state (market) sector of the economy, 60% of the capital of privatized enterprises has been transferred to private ownership. Kazakhstan is intensively searching for new ways to exit the deep economic and social crisis which has arisen during the last years. The main way is to improve the basic branches of economy. The transfer of large industrial enterprises to contract management of local and foreign companies is considered to be one direction to overcome that crisis. During two last years, 42 contracts were concluded, 30 of which operated to the end of 1995. Kazakhstan is used as an intermediate zone for the transportation of natural gas of the republics of Central Asia to Russia. The natural gas of Kazakhstan is transferred to Russia without any processing, but not to its users, even in the western region where the gas is extracted. Because of this, the main problem of Kazakhstan is the necessity of the improvement of usage within the republic and the modernization of the present infrastructure. An extensive territory, large differences in climate and geographic conditions, and a low population density make the problem of transport in Kazakhstan more important and significant. Though during the Soviet regime large quantitative and qualitative improvements to transport infrastructure took place. The total length of railroads on the territory of the republic reached 14,500km; the total length of paved highways was 82,000km; air routes were 108,000km; and internal navigable waterways, 4,000km. However, the main type of transportation for most cargo and passengers (including international connections) is by motor vehicle, which is not a very effective means of conveyance. Even in the best years, the share of railway transport has been small; only 12% of dispatched cargo and less than 20% of passengers on inter-city routes. The share of aviation and river transport is very insignificant in cargo transportation. As for passenger departures, air and water routes represent less than 4% of the total volume of passenger service. Nevertheless, one can confirm that transportation in our republic, even according to "Soviet" standards, is not badly developed. If one can take into account that the transportation infrastructure of the current state must correspond with world standards, the necessity of urgent and deep modernization becomes clear. In spite of its remoteness from any ocean, being the bridge between Europe and Asia and having a huge territory laden with the high potential for transport (transit) between other states, Kazakhstan can form a world land bridge via its territory. Even in ancient times, the people who inhabited the territory of modern Kazakhstan and Central Asia completely took advantage of the neighborhood, establishing a route of the Great Silk Road. The total length of the Silk Road is 6,500km, from southeast China to the Mediterranean coast of Turkey. A large quantity of goods and the exchange of advanced culture passed through these lands. Realizing these advantages, Kazakhstan has managed to make the first steps in the restoration of the route, using the most modern transport means. Currently, Kazakhstan is connected with China by all types of modern transport (railway, highway, aviation) Practically, Kazakhstan can deliver cargo from European and Asian countries to any province of China, or to the countries of Southeast Asia. Sea transportation has been established through Iran, and mixed connections (railway and road) have been opened with Turkey. In May 1996, a short railway which extends to Iran and the borders of Turkmenistan was established. Thus, the Great Silk Road has been restored in a railway variant from the Chinese Far East to Europe. Kazakhstan is working together with China to develop the station "Druzhba". Millions of tons of cargo from many countries of the world will pass via this station in the near future. The electrification of the railways of the southern and northern sections is nearly completed. The radical reconstruction and development of Almaty international airport and other airports of the republic have already begun. Plans for the increase of the capacity of the harbor on the coast of the Caspian Sea are already in effect. "But for the speeding up of all these wide-scale measures, which are also of international significance, Kazakhstan needs investment. For one thing, investments are necessary for the development and modernization of the railways in the south, then for the modernization of ground routes and the system of aviation management.